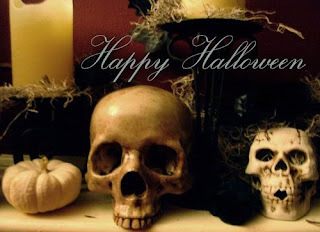 halloween, a night for ghosts, ghouls, spirits and what have you to pay a visit to those still existing in the living realm. very much like the oriental's hungry ghost festival, except that it is a one night event while the hungry ghost festival goes on for a whole month. miss the back and spoon breaking carving that can drive a person nutty, and creative devilish pumpkin faces that seemed to litter every corner of the street. miss the spooky halloween decorations of cobwebs, flickering lights and colors of orange, red and black. miss the door to door trick or treating, and candy stash enough to last a month, and more depending on how far one decided to trawl this night, that is likely to be every kid's dream and parent's nightmare. it is a night of dress up, a night of make believe, a night of supposed absolute freedom; a night of sin, a night of all things evil, a night of debauchery and greed; a night where a person could be anyone and everyone, and yet not be anyone, but anything; a night where a person finally lets down that farcial mask, only to dorn another, and live behind that other. in all honesty, really prefer the kids version of halloween despite the hassle from the intricate preparations needed to make this one night happen. it is after all the lesser evil, and an endless night of surprises with the mystery game of "wonder who is going to show up on my doorstep". yet, if it were possible, really would love to try doing it the traditional way when all hallows eve was still not quite so commercialized. just candlelight, and you at the grave, commemorating the dead. not quite as spooky and skin crawling as it seems. in fact, there is a peace that surpasses all understanding when one can actually muster the courage to spend the night over at the graveyard, provided one does not have skeletons hiding in the closet. maybe just not the chinese cemetary. having said that, where will you be this very night??? and yes, the devil in me has to say, peek a boo, happy halloween. how have you been? really haven't spoken to you in ages! are you still in SG? talk to me... text me or something? remember, if you need anything, call me. don't shoulder the weight of the world on your shoulders. Voted. :) You go girl.